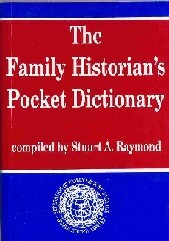 This month's featured book is The Family Historian's Pocket Dictionary compiled by Stuart A. Raymond. The 1939 Register can be accessed at http://www.findmypast.co.uk/1939register from 2 Nov. Further information about the register can be found here. The video below gives some further information. The free surname search of the Early Irish Death Index can be searched here. Access to their parish information, which includes parish register transcriptions, is available from here. Forces War Records, a subscription site, has added WWI Hospital Admission and Discharge Registers.